This paper presents a theoretical and methodological framework for a comprehensive landscape characterization, focussing on the largest and most complex urban realm: the metropolitan region. Landscape character has in recent years emerged as a new paradigm to understand, monitor and evaluate cultural landscapes undergoing change. The scope of characterization methods however, is by and large limited to the non-urban realm. In physical terms, the border between the urban and non-urban realms is becoming increasingly diffuse, particularly in metropolitan regions. Metropolitan regions thus conceptually challenge the scope of landscape characterization, as cities can also be understood to be in and of themselves a form of cultural landscape. Moreover, territories where urban and rural realms merge, result in new ‘hybrid’ types of space that fall outside existing characterization methods. The method developed and presented in this paper is aimed at producing a comprehensive landscape characterization tool for metropolitan regions in order to understand, evaluate and monitor their spatial form. The method developed combines elements from conventional landscape character assessment with urban morphology, mapping, and cluster analyses. 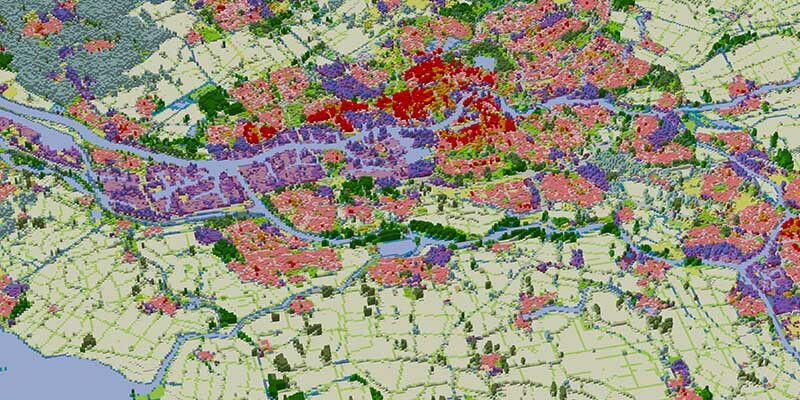 The first version of the method was tested using the metropolitan region of Rotterdam and resulted in a preliminary categorization of thirty-six metropolitan landscape types. Twenty-four of the thirty-six types are defined as ‘hybrid’ or mixed landscape types, which occupy approximately 30% of the territory. Their make-up is determined by formal varying densities of topographic elements, land use categories, and heights. The hybrid landscape types that have emerged as a result of applying this method are of particular interest, as they were not recognized as a specific category by other classification methods. The extent and character of these landscapes is not yet fully understood and therefore not used in the landscape policy forming. The method also reveals a substantial disparity between the assumed threshold of city and countryside in the Rotterdam region, and the one that has resulted from this study. The distribution of hybrid landscape types also shows that patterns of dispersion, diffusion, periphery and fragmentation have exceeded what is considered the peri-urban area of Rotterdam in administrative and planning circles. Antrop, M. (2000). Geography and landscape science. Belgeo, (2000, 1-4), 9-35. Antrop, M. (2003). The role of cultural values in modern landscapes. The Flemish example. In H. Palang, & G. Fry (eds. ), Landscape Interfaces: Cultural Heritage in Changing Landscapes, Dordrecht, Netherlands: Kluwer Academic Publishers, pp. 91-108. Antrop, M., Schmitz, S., Sevenant, M., Van Eetvelde, V., & Van Hecke, E. (2010). Atlas van Belgie. Deel 2: Landschap, platteland en landbouw. Gent, Belgium: Academia Press. Arnot, C., & Fisher, P. (2007). Mapping the Ecotone with Fuzzy Sets. In Morris, A., & Kokhan, S. (eds. ), Geographic Uncertainty in Environmental Security (pp. 19-32). Dordrecht, Netherlands: Springer. Berendsen, H. J. A. (2005). Fysische geografie van Nederland, deel 4: Landschappelijk Nederland. Assen, Netherlands: Van Gorcum. Bossard, M., Feranec, J. & Otahel, J. (2000). CORINE land cover technical guide. Copenhagen: European Environment Agency (Technical report no. 40). Castells, M. (2010). Globalisation, Networking, Urbanisation: Reflections on the Spatial Dynamics of the Information Age. Urban Studies, 47(13), 2737-2745. Cosgrove, D. E. (1999). Mappings. London, United Kingdom: Reaktion Books. Curdes, G. (1993). Stadtstruktur und Stadtgestaltung. Stuttgart, Germany: Verlag W. Kohlhammer. Dijkstra, H., & Lith-Kranendonk, J. Van (2000). Schaalkenmerken van het landschap in Nederland. Monitoring Kwaliteit Groene Ruimte (MKGR). Wageningen, Netherlands: Alterra (rapport nr. 40). Edelman, C. H. (1950). Voorlopige bodemkaart van Nederland, schaal 1:400.000. In Inleiding tot de bodemkunde van Nederland (bijlage). Amsterdam, Netherlands. Embleton, C. (ed.). (1984). Geomorphology of Europe. London, United Kingdom, MacMillan publishers. Frijters, E. et al. (2004). Tussenland. Rotterdam, Netherlands, NAi Publishers (RPB). Garreau, J. (1992). Edge City: Life on the New Frontier. New York, NY: Anchor. Groom, G. (2005). Methodological review of existing classifications. In D. M. Wascher (ed. ), European Landscape Character Areas. Typologies, Cartography and Indicators for the Assessment of Sustainable Landscapes (pp. 32-45). Report European Landscape Character Assessment Initiative (ELCAI). Hall, O., & Arnberg, W. (2002). A method for landscape regionalization based on fuzzy membership signatures. Landscape and Urban Planning, 59(4), 227-240. Jessel, B. (2006). Elements, characteristics and character–Information functions of landscapes in terms of indicators. Ecological Indicators 6(1), 153-167. Jones, A., Montanarella, L., & Jones R. (2005). Soil Atlas of Europe. European Soil Bureau Network, European Commission. Jongmans, A. G., Van den Berg, M. W., Sonneveld, M. P. W., Peek, G., & Van den Berg van Saparoea, R. M. (2013). Landschappen van Nederland. Geologie, bodem en landgebruik. Wageningen, Netherlands: Academic Publishers. Kim, K. H, & Pauleit, S. (2007). Landscape character, biodiversity and land use planning: the case of Kwangju City Region, South Korea. Land Use Policy 24(1), 264-274. Lipsky, Z., & Romportl, D. (2007). Classification and typology of cultural landscapes: methods and applications. The Role of Landscape Studies for Sustainable Development. Warsaw, Poland: University of Warsaw, 519-535. Matassoni, F. R. A. N. C. A., Savino, M., Sernini, M., Torres, M., & Vettoretto, L. (1990). La citta diffusa. Istituto universitario di architettura di Venezia. Dipartimento di analisi economica e sociale del territorio. Meeus, J. H. A., Van der Ploeg, J. D., & Wijermans, M. (1988). Changing agricultural landscapes in Europe: continuity, deterioration or rupture? Rotterdam, Netherlands: IFLA conference. Meeus, J. H. A., 1993. The transformation of agricultural landscapes in Western Europe. The Science of the Total Environment, 129 (1), 171-190. Meeus, J. H .A. (1995). Pan-European landscapes. Landscape and Urban Planning, 31(1), 57-79. Metzger, M. J., Bunce, R. G. H., Jongman, R. H. G., Mücher, C. A., & Watkins, J. W. (2005). A climatic stratification of the environment of Europe. In M. J. Metzger (ed. ), European vulnerability to global change – a spatially explicit and quantitative assessment (pp. 101-128). Wageningen, Netherlands: Wageningen University. Muecher, S. and Wascher, D. M. (2007). European landscape characterisation. In B. Pedroli, A. van Doorn, , G. de Blust, M. L. Paracchini, D. Wascher, & F. Bunce (Eds. ), Europe’s living landscapes. Essays on exploring our identity in the countryside. Utrecht, Netherlands: KNNV. Muecher, C. A., Klijn, J. A., Wascher, D. M., & Schaminée, J. H. (2010). A new European Landscape Classification (LANMAP): A transparent, flexible and user-oriented methodology to distinguish landscapes. Ecological Indicators, 10(1), 87-103. Neutelings, W. J. (1994). Explorations into wonderland: riding the periphery of Low Countries, The Patchwork Metropolis. Architectural Design, 64, 58-63. Nijhuis, S., & Reitsma, M. (2011). Landscape policy and visual landscape assessment. The Province of Noord-Holland as a case study. Research In Urbanism Series, 2(1), 229-259. Nijhuis, S., Van Lammeren, R., & Van der Hoeven, F. (eds.). (2011). Exploring the Visual Landscape. Advances in Physiognomic Landscape Research in the Netherlands. Amsterdam, Netherlands: IOS Press. Nijhuis, S., & Pouderoijen, M. T. (2013). De polderkaart van Nederland. Een instrument voor de ruimtelijke ontwikkeling van het laagland. Bulletin KNOB, 112(3), 137-151. Nogue, J., & Sala, P. (2006). Prototype landscape catalogue. Conceptual Methodological and Procedural Bases for the Preparation of the Catalan Landscape Catalogues Obervatori del Paisatge, Olot/Barcelona. Painho, M., & Augusto, G. (2001). A Digital Map of European Ecological Regions. Anwendung und Auswertung der Karte der natürlichen Vegetation Europas. Insel Vilm, Bundesamt für Naturschutz, Internationale Naturschutzakademie. Planbureau voor de Leefomgeving (PBL), Evaluatie natuur- en landschapsbeleid, Achtergrondrapport bij de Natuurbalans 2008. Planbureau voor de Leefomgeving (PBL), september 2009 Natuurbalans 2009; PBL-publicatienummer 500402017. Piket, J. C., Kalkhoven, J. T. R., Veer, A. A. de, & Vos, W. (1987). Landschap. The Hague, Netherlands: Staatsuitgeverij (Wetenschappelijke Atlas van Nederland 16). Pinzon Cortes, C. (2009). Mapping Urban Form: Morphology studies in the contemporary urban landscape (PhD thesis). Delft, The Netherlands: TU Delft. Ritsema van Eck, J. van, Amsterdam, H., & Schuit, J. van der (2009). Ruimtelijke ontwikkelingen in het stedelijk gebied; dynamiek stedelijke milieus 2000-2006. Den Haag, The Netherlands: PBL. Roos-Klein Lankhorst, J., Buijs, A.E., Berg, A.E. van den, et al. 2002. BelevingsGIS versie februari 2002. Wageningen: Alterra (werkdocument 2002/08). Roos-Klein Lankhorst, J., de Vries, S., & Buijs, A. (2011). Mapping landscape attractiveness–A GIS-based landscape appreciation model for the Dutch countryside. Research In Urbanism Series, 2(1), 147-161. Rowe, P. G. (1991). Making a Middle Landscape. Cambridge, MA: MIT Press. Sevenant, M., & Antrop, M. (2010). The use of latent classes to identify individual differences in the importance of landscape dimensions for aesthetic preference. Land Use Policy, 27, 827-842. Sieverts, T. (2003). Cities without Cities: An interpretation of the Zwischenstadt. London, United Kingdom: Routledge. Slak, M., & Lee, A. (2003). Indicators of Landscape Dynamics: On-going Land Cover Changes. In W. Dramstad, & C. Sogge (eds.). (2003). Agricultural impacts on landscapes: Developing indicators for policy analysis. Proceedings from the NIJOS/OECD Expert Meeting on Agricultural Landscape Indicators in Oslo, Norway, Oct. 7-9, 2002. NIJOS Report 7, 116-129. Soja, E. (1992). Scenes from Orange County. In M. Sorkin (ed. ), Variations on a Theme Park, (pp. 94-122). New York, NY: Hill and Wang. Stafford, H. A. (1962). The Dispersed City. The Professional Geographer, 14(4). Steenbergen, C.M. et al., 2011. Metropolitan Landscape Architecture. Urban parks and landscapes. Bussum, Netherlands: THOTH publishers. Steenbergen, C.M., Reh, W., Nijhuis, S., & Pouderoijen, M.T. (2009) The Polder Atlas of the Netherlands. Pantheon of the Low Lands. Bussum, Netherlands: THOTH publishers. Swanwick, C. (2002). Landscape Character Assessment: Guidance for England and Scotland: Prepared for the Countryside Agency and Scottish Natural Heritage by Carys Swanwick. Countryside Agency. Thiel, P. (1961). A sequence-experience notation. Town Planning Review, 32(1), 33-52. TNO, 2009. Geologische kaart van Nederland. In De Bosatlas van ondergronds Nederland. Groningen, Netherlands: Wolters-Noordhoff, p. 11. Van der Hoeven, F., & Nijhuis, S. (2012). Developing Rotterdam’s Skyline. CTBUH Journal, 2, 32-37. Van der Meijden, R. (1996). Heukels’ Flora van Nederland. Leiden/Groningen, Netherlands: Rijksuniversiteit Leiden/Wolters-Noordhoff. Van Eetvelde, V., & Antrop, M. (2003). De landschapsatlas van het Vlaamse Gewest. De Aardrijkskunde, 27(1-2), 21-30. Van Eetvelde, V., Sevenant, M., & Antrop, M. (2006). Trans-regional landscape characterization: the example of Belgium. R.G.H. Bunce, R.H.G. Jongman (eds. ), Landscape Ecology in the Mediterranean: Inside and Outside Approaches. Proceedings of the European IALE Conference, 29 March-2 April 2005, IALE Publication Series 3, Faro, Portugal, pp. 199-212. Van Eetvelde, V., & Antrop, M. (2009). Indicators for assessing changing landscape character of cultural landscapes in Flanders (Belgium). Land Use Policy, 26(4), 901-910. Van Eetvelde, V., & Antrop, M. (2009). A stepwise multi-scaled landscape typology and characterization for trans-regional integration, applied on the federal state of Belgium. Landscape and urban planning, 91, 160-170. Van Eetvelde, V., Van de Velde, L., Sevenant, M., & Antrop, M. (2010). Landscape Atlas of Flanders+ 10: a decade of experiences outlining integrated landscape research for the future. European Network of Universities for the Implementation of the European Landscape Convention (UNISCAPE). Vanempten, E. (2012). LE: NOTRE Landscape Forum. Journal of Landscape Architecture, 7(2), 88-88. Visscher, H.A., 1972. Het Nederlandse Landschap. Een typologie ten behoeve van het milieubeheer. Utrecht/Antwerpen, Netherlands, Belgium: Spectrum. Wascher, D.M. (ed.). (2005). European Landscape Character Areas–Typologies, Cartography and Indicators for the Assessment of Sustainable Landscapes. Report European Landscape Character Assessment Initiative (ELCAI). Wascher, D. M., Schuiling, C., Hazendonk, N., & Looise, B. (2008). Map of European Leisurescapes. A Geographic Image of Tourist Values, Trends and Potentials in European Landscapes. In: Sijmons, D., Venema, H. Hazendonk, N. Hendriks, M., Dijk (eds. ), Greetings from Europe, Landscape & Leisure. Rotterdam, Netherlands: 010 publishers. Zonneveld, J. I. S. (1985). Levend land. De geografie van het Nederlandse landschap. Utrecht/Antwerpen, Netherlands, Belgium: Bohn, Stafleu Van Loghum.